It's been a decade and a half since Ontario Hydro was broken up into 5 successor companies. Recently the generating company that is one of those successors, Ontario Power Generation (OPG), reported it's 2013 results - which weren't very good. Earlier in the year Hydro One - the transmission and distribution successor - released 2013 financial results that indicated a record net income. A day after OPG's 2013 results were released the government announced new Chairs to the Boards of both OPG and Hydro One. It's not surprising that both new Chairs have backgrounds as politicians as both entities have image problems. A recent report by the Auditor General of Ontario hammering costs at OPG has many clamoring for changes in the governance there, and Ontario's Ombudsman has an active investigation into Hydro One's "billing practices and the timeliness and effectiveness of its process for responding to customer concerns." 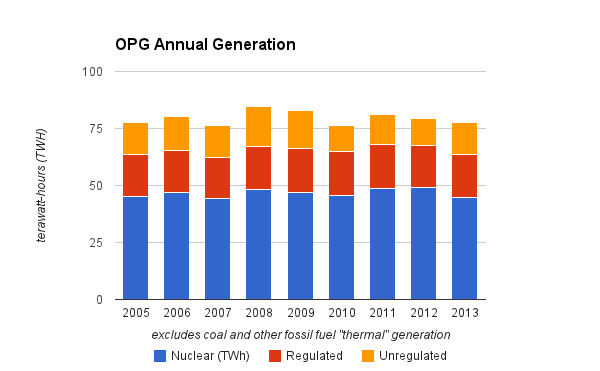 OPG's 2013 performance is impacted by other entities. This post is a broad overview of today's status of successor companies to Ontario Hydro , particularly in terms of their impact on the public generator. The Ontario Electricity Financial Corporation is, as noted in its first annual report, "the legal continuation of Ontario Hydro ... responsible for ensuring the prudent and efficient management of $38.1 billion (as of April 1, 1999) in debt, derivatives and other liabilities of the former Ontario Hydro." Ontarians might think the OEFC is paying down debt, because since Ontario's wholesale market opened May 1st, 2002, they've been charged 7/10th of a cent on each kWh of consumption as a debt retirement charge (DRC). That works out to around $1 billion a year. Ontarians thinking debt at "the legal continuation of Ontario Hydro" is going down are wrong. Looking at the history of annual financial reports, the total debt level of the OEFC is higher in the most recent report (see pg1-105) than it was in the report preceding the election of Liberal Dalton McGuinty as Premier of the province in 2003 (pg 16 here). 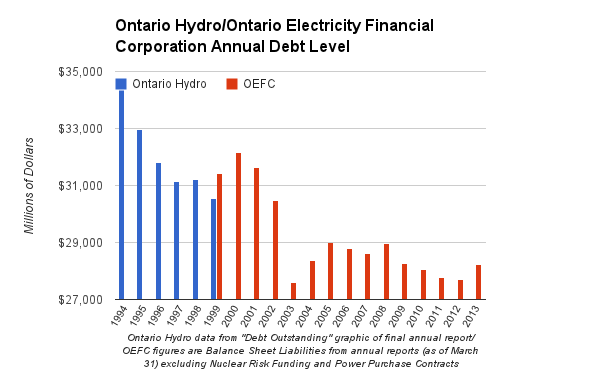 The data shows the the revenue tools given to the OEFC have not resulted in debt being lowered in the past 14 years as much as it was in the 5 years before the OEFC "legally continued" Ontario Hydro. It's also notable that the OEFC hasn't posted annual figures, on their site, for their fiscal year ending March 31, 2013 - whereas Hydro One and OPG have posted their reports for fiscal years ending December 31st, 2013. Profits at OPG and Hydro One are one tool that could fund the OEFC's alleged task of paying down debt; others are the debt retirement charge(DRC) and payments-in-lieu of taxes (PIL). However, there's no evidence the OEFC is meeting the expectations of it as it come into existence 15 years ago. OPG reports 2013 net income for the year of $135 million - down $232 million from 2012. All of the decline, and more, can be attributed to the nuclear business segment. Although nuclear generation was lower than in 2012, it was within the 44.2-49 terawatt-hour (TWh) range it's been in since 2005. Gross margin was down only $142 million while the loss of $19 million was a drop of $383 million from 2012 - meaning the majority of the loss was due to non-generation factors including some 2012 accounting changes that befitted only 2012, combined with whatever financial voodoo is involved with "depreciation and amortization" changing $146 million. ... massive increase in supply has been instrumental in the market price collapse and OPG’s decline. The public generator is being devalued at great cost to taxpayers by the collapse of the market price brought on by massive new and redundant non-coal sources of power. One of the treasures in OPG's rate hike request documentation, currently before the Ontario Energy Board, is that this supply is to be given a regulated rate - and 'the ask' appears to be around 4.8 cents/kWh (the average in 2008). This is the largest hike OPG is requesting for its business segments. The hikes will not necessarily be approved by the Ontario Energy Board (OEB), which has turned down rate requests from OPG in the past (I criticized a 2011 decision here). OPG's poor financial results for 2013 come after half a decade where their stable rates have hidden the impact of rapidly rising average costs from private generators - particularly non-nuclear ones. 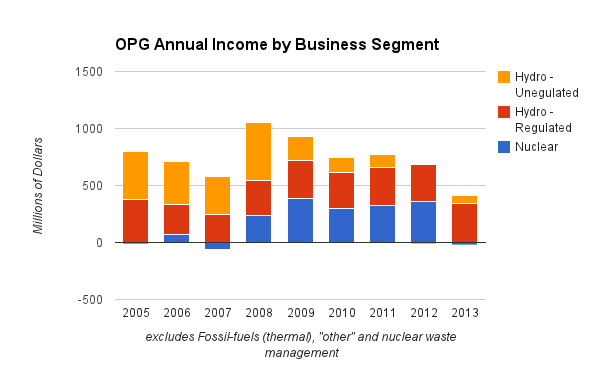 If OPG is being evaluated on it's ability to generate revenue, it had a bad year. 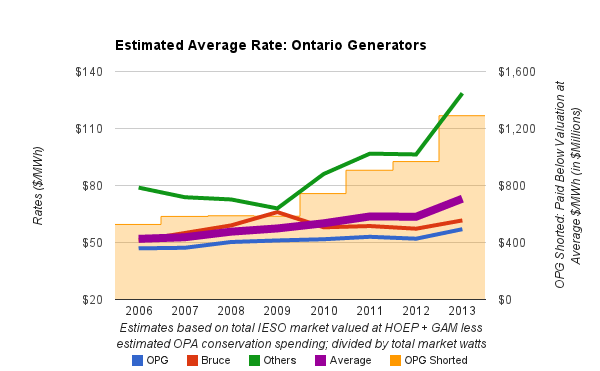 If OPG is evaluated on the basis of hiding the inflationary impacts of other generators, it had a good year. Had OPG received the average rate of all the province's supply, it would have ~$1.3 billion more revenue for 2013. 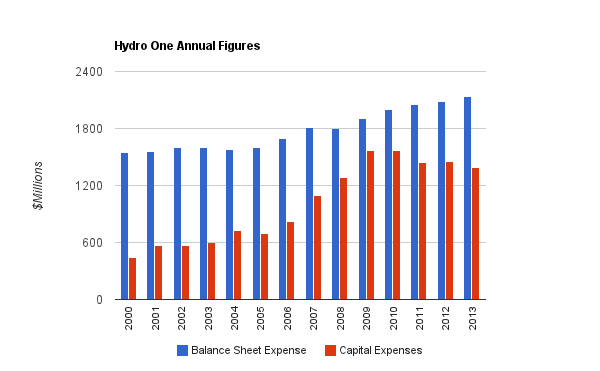 Hydro One, the distribution and transmission company originating in the breakup of Ontario Hydro, has been the money-maker; OPG last out-earned Hydro One in 2010; in the 3 years since then, Hydro One has averaged income of $730 million to OPG's $280 million. 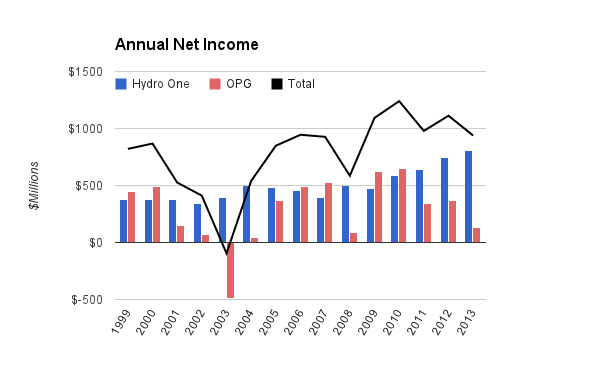 Hydro One has set a record for annual net income each of the past 4 years. More than 3 years ago I communicated how "smart" grid, metering in particular, and proposed transmission expansions to enable wind and solar generation, have been beneficial to Hydro One; all the capital spending allows it to ask for higher rates from the Ontario Energy Board (OEB). 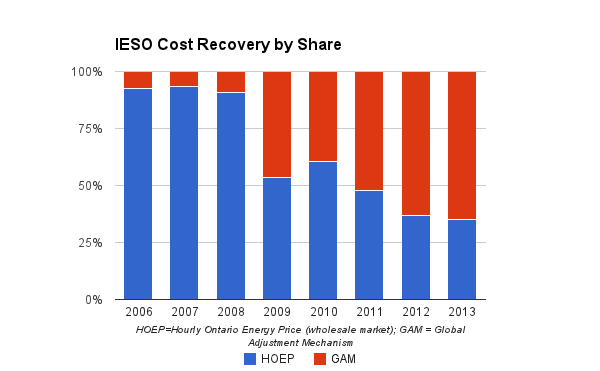 Hydro One's good returns are due to a growth in equity - rates being regulated on a return-on-equity basis. Only late in 2010 did the regulator seem to resist reckless spending as an outcome of any whim from the government (OEB ruling noted here). By that time, most Hydro One customers had smart meters installed and capital spending had peaked. Hydro One now claims it's customers are "currently paying $3.92 per month to recover smart meter-related costs." There's an additional charge paid to another entity of $0.806/month, so in fact the smart meter adventure is costing the average Hydro One customer $4.73/month - 28 cents more than OPG's rate request application which notes an estimated consumer impact of $4.45/month. Hydro One's current plans don't call for severe price hikes, but they do a call for 3 years of record capital spending. One possible future has them continuing to be the big revenue generator for the province, but there are some threats on the horizon. One is a general backlash against basic billing competency eroding under all the capital-intensive "improvements" to metering and billing systems - which should prevent the regulator from falling back to rubber-stamping rate requests. The greater threat is one not unique to Ontario - it is self-generation. Another of the successors to Ontario Hydro, the Independent Electricity System Operator, is exploring net metering policies that are likely to negatively impact Hydro One's revenues. Upon the break-up of Ontario Hydro the Independent Market Operator (IMO) was created - it was renamed the Independent Electricity System Operator (IESO) for 2005. If the IESO is evaluated on the basis of its current name, it could do well - the system operates. If it was evaluated on the implication of the original name - in terms of the functioning of the electricity market - it would not score well. In 2013 the market recovered the lowest percentage of the cost of supply in it's history (the Global Adjustment Mechanism existing to recover the full cost of supply). Ontario added supply as prices dropped (along with demand) as the government refused to depend on a market's price movements to signal generators to enter, or exit the market. The contracting of new supply was decreed by the government, and carried out by the Ontario Power Authority (OPA), but the IESO has long been active in preventing existing supply from closing. They contracted OPG to keep the Lennox Generating Station operational as far back as 2006. OPG had written off the plant citing, in its 2005 financial results, lost expectations of a capacity market concurrent with the government's initiative to procure 2,500MW of new supply. The IESO will continue to monitor the progress of the coal replacement program and will provide timely advice and notice on when circumstances are such that the units can be put on reserve status and then removed from service. In January 2013 it was not the IESO, but lame duck Premier Dalton McGuinty, announcing the closure of the final 6 coal-fired units in southern Ontario. Ontario's ratepayers will continue to fund contingency payments throughout 2014. It's never been apparent that the IESO considers the abundance of supply to be relevant to the functioning of a market. 9 years and $2.6 billion after they agreed to pay for Lennox to be available , the IESO is now to investigate the capacity markets that OPG had felt imminent a decade ago. Despite the billions received to keep the generating units available, the unregulated thermal business unit of OPG lost over half a billion dollars since 2006. OPG's 2013 financial results weren't good, but there's reasons for that beyond OPG. Low revenues from wholesale market sales at continued very low rates are, in part, due to excessive government procurement policies and a very cautious system operator (in terms of capacity). The bigger issue may be environmental/cultural. No government has been enthusiastic about public power for over 2 decades - and that includes governments formed by 3 diverse parties. This can't be good for morale. The Liberal government's push for wind and solar power shoved hydroelectric power aside. The Green Energy Act, passed in 2009, raised the rates for solar and wind contracts as revenues for OPG's unregulated hydro revenues were dropping rapidly. Perhaps worse, those contracts gave priority to the new generators. OPG's annual report states, "dispatching hydroelectric units down to reduce production" is the first choice of curtailment options at the IESO. There's a limit on OPG's ability to contribute to its future through superior operations. The Auditor General's 2013 report appalled people with it's depiction of reckless spending at the generator, but it's important to review what happens to revenues from Hydro One and OPG. All revenues go to the sole shareholder (the Province), and the law is that the first $520 million pays interest on a supposed $8.885 billion debt, and the remainder pays down another defined debt (the residual stranded debt). Neither OPG nor Hydro One can retain earning to invest in new opportunities. Worse, the reality is that the earnings legislated to retire debt aren't actually being paid to the OEFC, but only recorded as an asset "Due from Province..."
That asset was $3.266 billion as of March 31, 2013; the last time the Province actually used electricity sector revenue to actually pay down electricity sector debt, Ernie Eves was the Premier of Ontario. The 5th original successor entity to 1998, as per the Electricity Act, 1998, is the Electrical Safety Association (ESA). An overview of contingency payments to Ontario Power Generation, is here. The $2.6 billion figure assumes that the revenue line "Other" is revenue from the agreement (now for only Lennox as "Contingency support agreement" is a separate line item - for the coal stations).